Tedeschi Trucks Band to perform at the San Diego Civic Theatre on May 12, 2019! San Diego, CA. January 9, 2019 - Tedeschi Trucks Band to perform at San Diego Civic Theatre located at 202 C St San Diego, CA 92101on May 12, 2019. This show is ALL AGES and begins at 7:00 PM with doors opening at 6:00 PM. Tickets are $45.00, $60.00, $75.00, $85.00 and all price levels will increase by $5.00 on the day of the show. Tickets go on sale January 18 at 10:00 AM PST and are available at Ticketmaster by phone at 619-570-1100, or in person at the San Diego Theatres’ Advance Sale Windows. 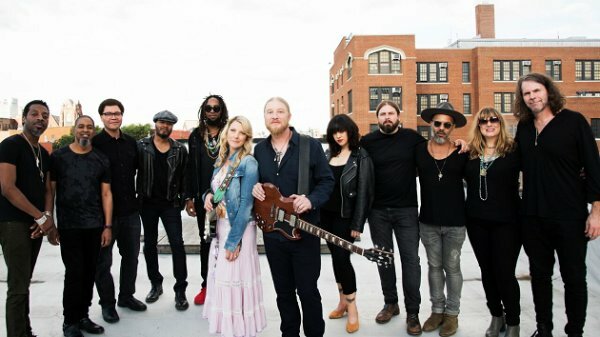 The 12-member strong Tedeschi Trucks Band carries a distinguished reputation as one of the premier live bands performing today. Embracing improvisation over convention, and rarely repeating a set list, the genre-defying collective has seemingly endless potential to explore any musical territory-from their own catalog of Grammy-winning originals to Sly & the Family Stone, Miles Davis, George Jones, Joe Cocker or Nina Simone. Derek Trucks’ masterful guitar skills and Susan Tedeschi’s soaring vocals and bluesy guitar shine but don’t overpower the breadth of world-class musicianship on stage, a testament to the genuine respect within TTB’s ranks. The band’s latest concert film/audio release Live from The Fox Oakland, nominated for a 2018 Grammy, makes it clear that Trucks and Tedeschi have no intention of slowing down now. “I haven’t found this band’s ceiling yet,” says Trucks in the film. For Tedeschi Trucks Band, there may not be one. For more information please visit: Tedeschi Trucks Band .